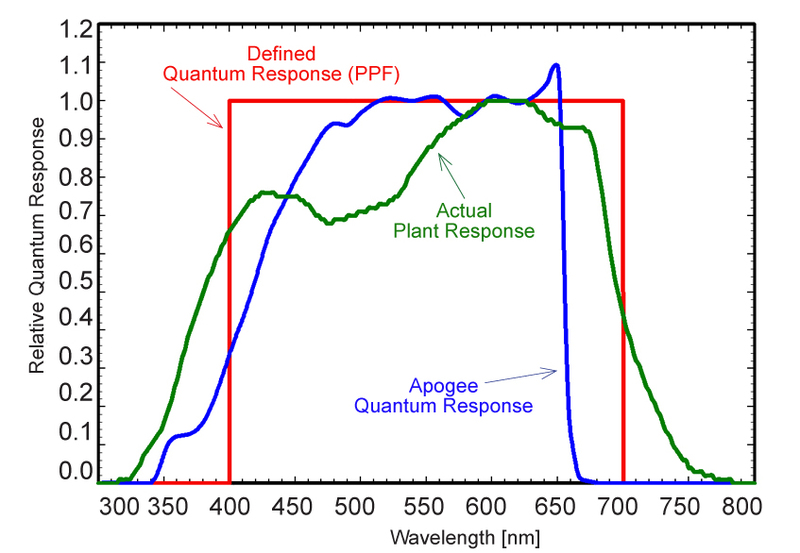 Since 1972 when a scientist named Keith McCree demonstrated that counting photons in the photosynthetically active range (400 to 700 nm) would better predict photosynthesis than the measurement of foot-candles, the quantum sensor has been used to measure radiation for plants. 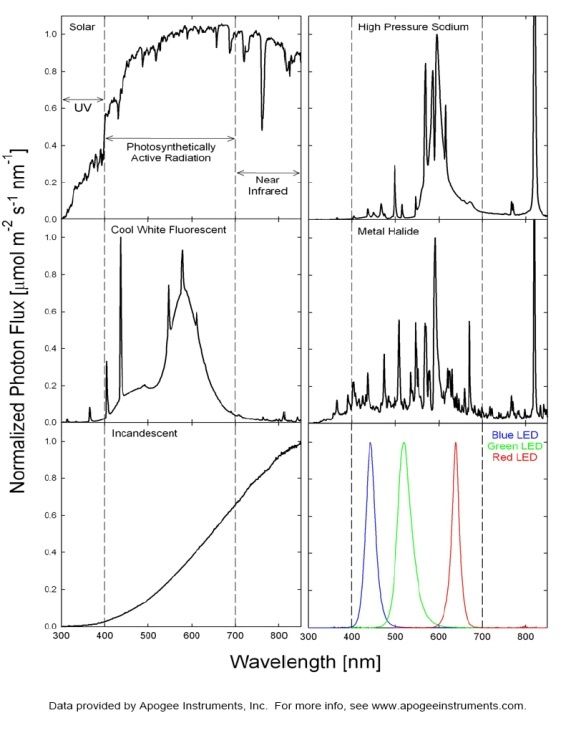 This is called the photosynthetic photon flux (PPF). 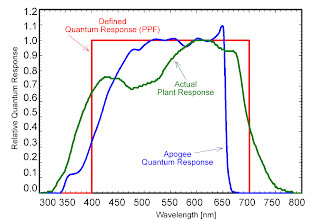 The following graph shows McCree’s findings for the actual plant response (green) along with the defined quantum response (red) and Apogee’s quantum sensor response (blue). Notice that the defined quantum response appears as a perfectly flat spectral response, meaning it weights all wavelengths of light exactly the same between 400 and 700 nm. Apogee offers quantum sensors that are calibrated for either sunlight or electric light. The reason for this is due to the significant differences in spectral output among light sources. The following graphs illustrate those differences. Here at Apogee, our quantum sensors for electric lighting are calibrated under high output T5 fluorescent lamps. The above differences in response indicate that there will be differences in sensor output if it does have a perfect spectral response. While the difference in calibration is less than 10% between electric light calibration (T5s) and sunlight calibration, it is also important to note the differences between T5 and other common electric light sources. The following table summarizes differences among lamp types.